If you’ve read the headlines, you know that the majority of schools are no longer teaching cursive writing. Now more than ever the world is in need of Learning Curve! Learning Curve mimics traditional cursive lettering practice worksheets, but with a modern style that I developed from my handwriting. This is the second major update. It was a lot of work, but it’s finally done! In the latest version, you will find a lot of new features. First, the Learning Curve family finally has a bold style! Language support was increased to include Central European. Some characters were redrawn to give them a little more finesse. The dashed version was completely redrawn to eliminate the overlapping dashes. Lastly, a dingbat was created to house the guidelines and drills. Learning Curve has never looked better! 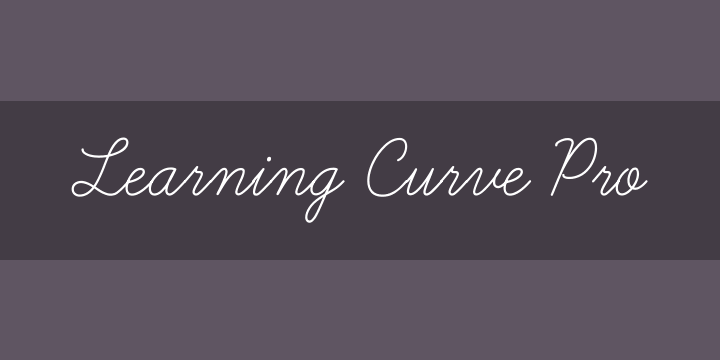 Here is what’s included: Learning Curve Regular, Learning Curve Bold, Learning Curve Dashed & Learning Curve Dings.